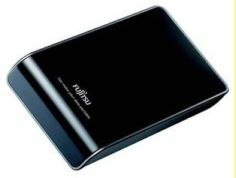 The leading supplier of innovative computer products which include hard disk drives, peripherals and biometric security solutions, Fujitsu has announced the HandyDrive MMH2 UB series of 5400 RPM external hard disk drives which featuring an ultra-slim, lightweight and easy to hold 2.5 inch design with up to 500GB capacity. As compared to the earlier model, the HandyDrive able to reducing read/write power consumption by 30% and 35% in stand by mode over normal operation. The Fujistu HandyDrive MMH2 UB series features with USB interface and available in variety range of capacities such as 250GB, 320GB, 400GB and 500GB. These capacity points are ideal for backup and supplemental storage for home PCs and laptops. It weigh is less than 6 ounces and with the dimension of 137.5mm X 83.5mm X 15mm. Apart of that, the HandyDrive also bundles with utility software that allow users to manage partitions, password lock tool to protects data from used by unauthorized users and Acronis True Image Personal HDD software, which provides fast and easy data backup. The Fujitsu HandyDrive series is expected in the market at first quarter 2009 through retail or online stores.